In the last week I have stumbled upon replacements for not one, but TWO of my favorite Surly brews that I’ve been missing dearly. 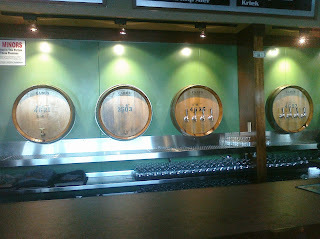 The first was Green Flash West Coast IPA at The Beermongers. This great place only has four or five beers on tap at a time, but they are always quality ones and like usual, this evening I was having a hard time deciding which one…first. Having been pleased with the Green Flash beers I’ve had in the past, and not one to shy away from an IPA, that one got the nod. However, it was with Mag’s assistance that I realized that both the taste and aroma were strikingly similar to Surly Furious. Hazzaah! Fast forward a week when I decide to visit The Eastburn for their can’t-be-beat Tuesday deal: $2 pints all day. After a too-malty-for-me IPA at their main bar, I headed down the steps to their second bar, which carries a completely different set of beers. Once again I gave into my IPA infatuation, going for Bear Republic’s Fresh Hop IPA. The first sip tickled my brain, urging me to take another sip and another whiff. Low and behold, this IPA had the same odd but loveable tea characteristics I firmly associate with Surly Bitter Brewer. Score! For all the wonderful beers I’ve found out here, I nearly cried with joy in finding these Surly substitutions. Like Bitter Brewer, the fresh hop is likely in waning supply but I’m hoping I’ll be able to find Green Flash IPA on a more consistent basis to feed my Furious cravings. Now if I could only find a Coffee Bender substitution…that’s probably dreaming a little too much, huh? 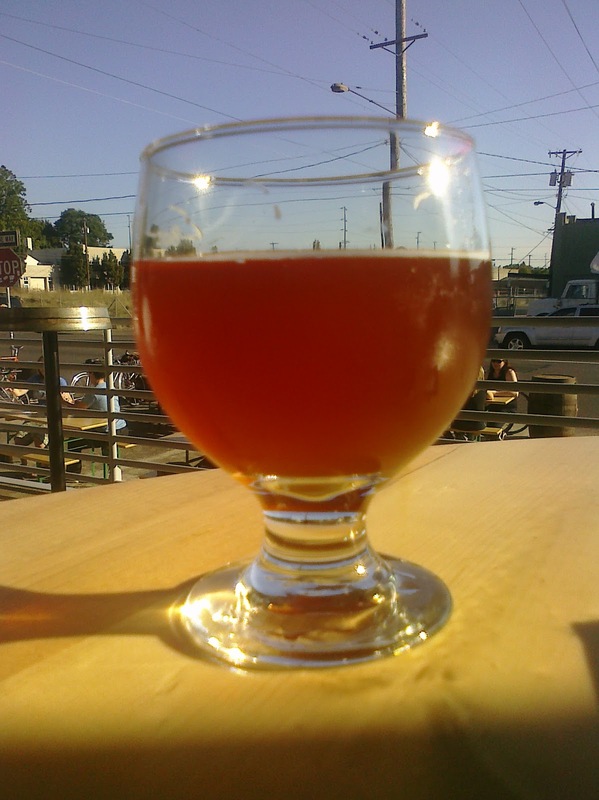 You’ve heard about my newest love, sours. Last night we checked out the newly opened headquarters of sours in Portland, the Cascade Brewing Barrel House. To whoever was responsible for picking this location, you get a big thanks from me! Not only is it relatively close to where we live, it’s also just across Belmont from the Green Dragon and a few blocks north of the Lucky Lab on Hawthorne. 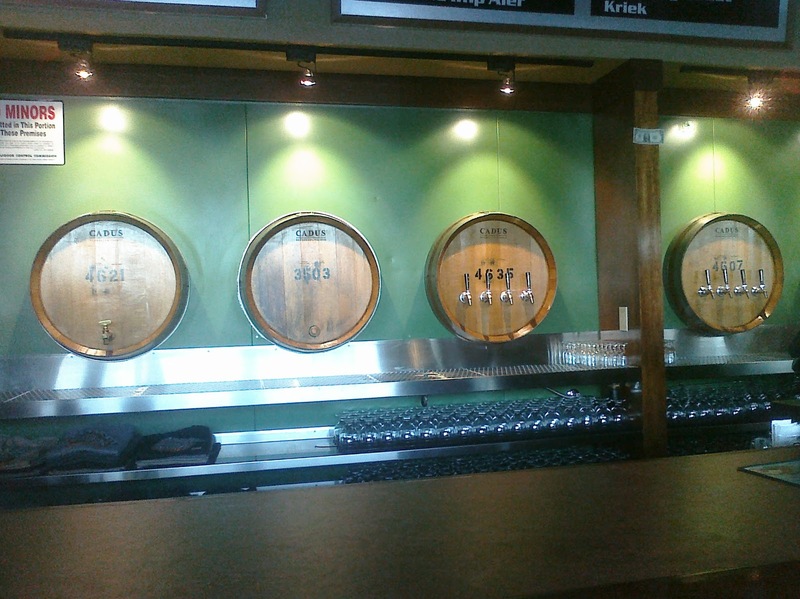 Of the 17 beers on tap, 13 were sours so the choice of what to order first wasn’t an easy one and when our waitress came by I panicked, ordering the apricot. As I waited for it to arrive, I thought back to our trip out to the Raccoon Lodge with the McG’s and was pretty sure I’d had it before. As it turned out, our waitress was overwhelmed and Mag ended up going up to the bar to place our order so I had a chance to rectify that, ordering a beer they had just put on tap – Beck Berry. 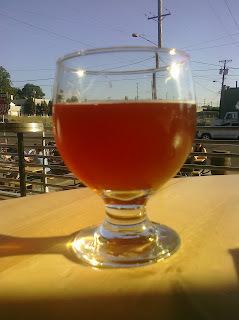 There was no description of Beck on the menu and with the place hopping with folks watching the Timbers game or cueing up to watch the Ducks game, the best description to be had was that this was their first and would be their last beer made with Brett. Brett! My heart sang and my mouth was not disappointed. Next up I had to give their Funk II, a sour wheat a try. Currently it was the only one coming directly out of the barrel, being “dusted” with a small amount of carbon dioxide to carbonate and coming out of a traditional German brass tap (on the left in the picture below). * Again, without a description on the menu I wasn’t able to find out much other than either Funk II was a component of Noyeaux, or the other way around. Mag had ordered the Noyeaux so we were able to try the two side by side and while it was clear there was a relationship between the two, they were distinctly different and each very tasty in their own right. My love of Brett drove me to return to Beck** once more before we headed out and if I can swing it, I’ll be making another trip back to Cascade to get some more of it before it vanishes. 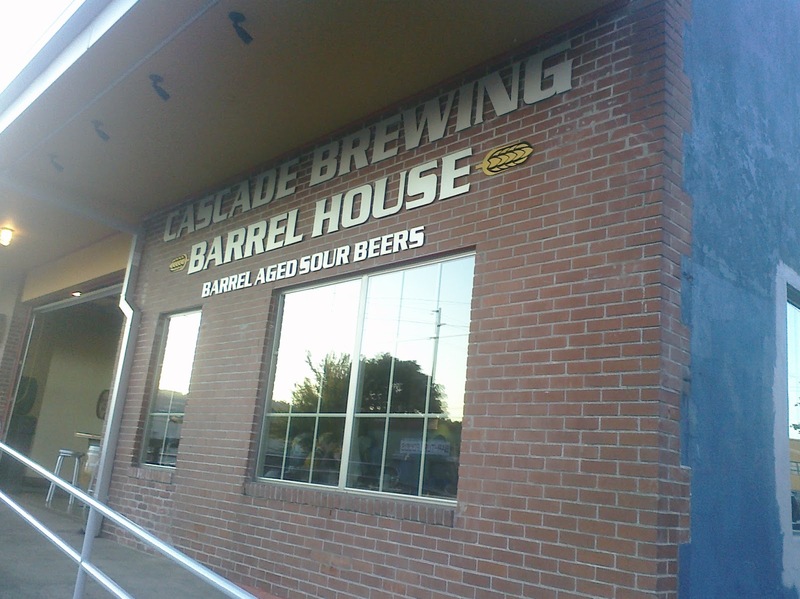 And if you like sours make sure to put Cascade on your radar. You won't be disappointed. *Thanks to the exceedingly well timed placement of the October/November issue of the Northwest Brewing News for this explanation. **A check to their website the next morning produced some more info on Beck. Click here and scroll down all the way to the bottom if you’re so inclined.